Lets have a little fun with pics in here. 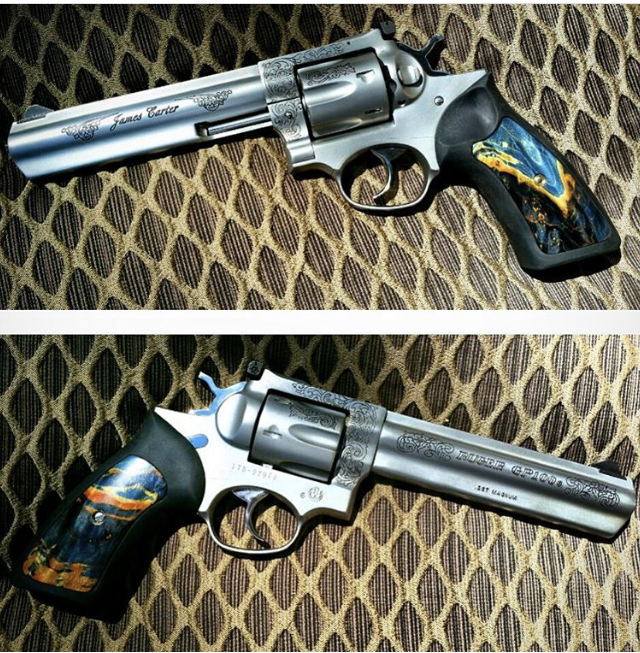 I love old revolvers, specially done up ones with western scrolling and customizing. All about old style bolt action rifles too or muzzloaders. Give a little story if you like or just show off what your proud of to own. Couple years ago, i was building my buddy Levi's engine for his dmax and his truck needed some love in other areas than just the engine. I had always wanted a done up revolver to either just keep on a shelf or put away to hand down. cost was never in my thought and wanted it unique. levi is big into guns and has good friends that do this kind of work. Worked a trade deal and gave him my Ruger GP100 my dad gave me when for christmas years ago (bought it new for me as he knew how much i liked revolvers over others). I think the cool part is now that my soon to be born son will have the same first and last name as my dad and i, it will be something cool to hand down to him down the road. ill find some pics of my shotgun and post a story with that. Im not a huge gun guy but ive got some toys. This ruger, s&W MP Shield 9mm i daily carry, Savage HMR 17 i just picked up, ruger 10/22, and my 1976 or 75 S&W 12ga semi auto. Nice revolver James! Revolvers have a special place in my heart too. The only 2 I have in my possession. Top is my grandfather's Stevens Arms crack-shot 22 long rifle. I know it has a homemade firing pin and other parts. Its beat up and only has sentimental value. Bottom is my wife's grandfathers Riihimaki .222 my understanding is they are extremely accurate varmint rifles and fetch $1k. It's a beautiful gun. We have a few more that are coming to me. Nothing fancy or that should even be shot any longer probably. I have one that almost got away. When I still lived at home I had my guns in Mom and Dads safe. I went out one day and noticed the browning buck mark .22 pistol was gone. I’ve had that gun for 15+ years. I ask Dad what happened to the browning pistol? He said I sold it to your brother. I said it was mine, he said that’s between you and him. I said what? I called my brother and said I need my pistol back and you can get your money from Dad. The next day I bought my own safe. Our son is the only male of his generation. My brother and all our cousins have daughters. One of my cousins has two daughters and also has a lot of guns and for our sons second birthday he told me, I’m gonna give him a gun. I want him to have it to keep in the family and pass it down. He comes over and has a gun wrapped up. We open it and it’s a Beretta Ducks Unlimited 12 gauge. Never been fired, only made 3,500. Beautiful gold inlay. All the chokes, etc. I was amazed. The first duramax I had a friend that had an aluminum camper shell and I bought it for $500 and put it on for hunting season. I hated it, couldn’t see. After hunting season I put it on Craigslist, for 2 years. I would have taken $250 to get it out of our yard. I changed my listing to “trade for man toy”. A guy text me a picture of a stainless revolver and ask would I trade. I said yes. I didn’t even ask what it was, I didn’t care I just wanted camper gone. He comes over, we trade and I get to looking and it’s a Smith & Wesson 66-4 .357, I get to reading about them and found they made it in several barrel lengths and 3” is the rarest. Well I got a tape and this one is a 3”. I carried it over to a friend who owns a gun store and he offered me $700 on the spot. I said I guess I better hang onto it, still got it. Oh Lordy! Next to trucks, guns are my greatest passion, especially stainless pistols!!! After seeing my first James Bond movie I was hooked on the franchise. I always wanted a Walther PPK and I always told myself one day I would have one. Well after years of telling myself that I finally got one a while ago. While searching for one I had told myself it has to be legit. no knockoffs, no late model versions, no 380 versions. After years of looking around I picked up a very clean, legit, 1935 British Police Walther PPK in .32ACP and I couldn't be happier. I don’t have a huge collection of firearms, but the one I’m most proud of is the first one I owned. It isn’t anything fancy. It’s just a cheap Winchester Model 70 chambered in .270 WIN made in the mid 90s that my dad bought second hand and gave me for my 18th birthday. A few years back I swapped out the synthetic stock for this laminated stock from Boyd’s and put on a cheap Redfield scope. It isn’t anything fancy, but it shoots well enough that it has killed every deer I’ve ever shot at with it. This is my favorite out of the few I have. Dad gave it to me when I was about 10. It’s just an off-brand youth .357 lever action. As you can see it’s not very long. I’ve killed a few deer, Along other animals with it. Just a cool little gun I’ll always have. im up to about 17 or 18 guns once i finish my current build. This is my S&W Model 29-2 1980, target hammer and trigger 6 or 6.5'' barrel, IIRC last year of recessed cylinder, pinned barrel and hand fit at the end of the line, don't shoot it very often, but probably wont get rid of it.